Sockeye Salmon Burgers. What’s your favorite seafood-based sandwich? For me, it’s hard to say. I like a nice lightly battered white fish sandwich with a touch of tartar sauce on a nicely toasted bun. Crab cakes are wonderful when served in sandwich format. 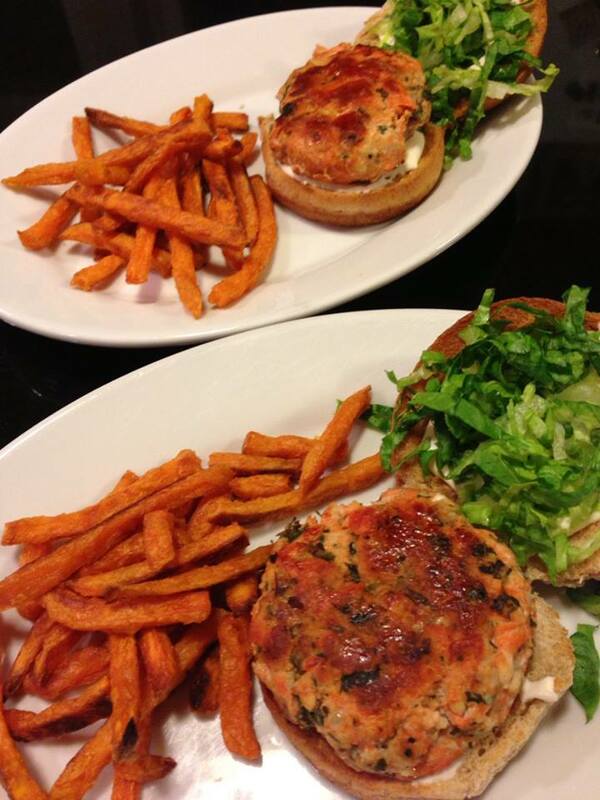 Another favorite, my Sockeye Salmon Burgers, are a healthier seafood alternative to the regular beefy burger. 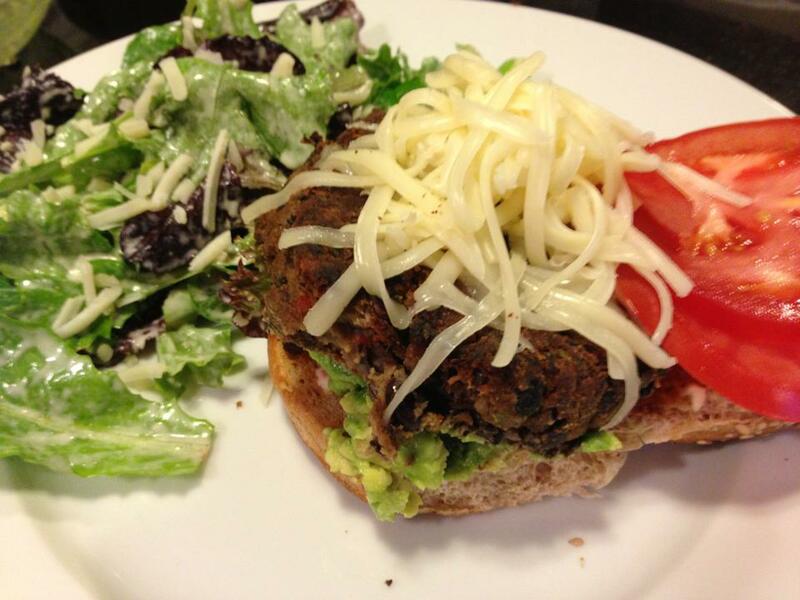 I’m on a burger kick with my Spicy Black Bean Burgers posting earlier this week. Last summer, I had some extra fresh Sockeye salmon that was left over from a previous dinner. 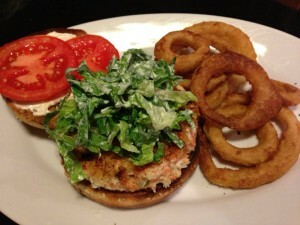 I thought about what to make, and salmon burgers made a lot of sense. 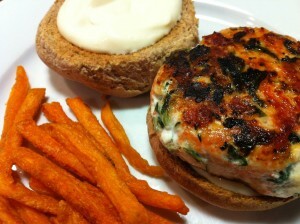 Since then, we’ve enjoyed these easy and tasty salmon burgers for lunch or dinner. 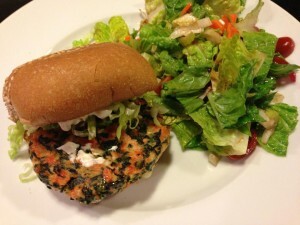 My favorite My Sockeye Salmon Burgers can be served on a bun with various fixin’s, or served bun-less alongside a nice tossed green salad. 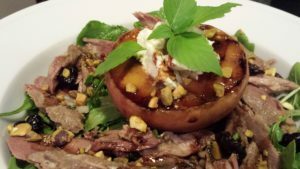 Try them with a Caesar salad draped with my husband’s Caesar Salad Dressing. With or without a bun, I like to serve my salmon burgers with either a garlic aioli or a tartar sauce depending on the filling. 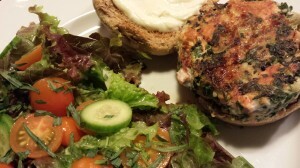 This recipe below is for my spinach and feta salmon burgers. I’ve modified Whole Foods Market’s version of these burgers. I like to make mine fresh and have made a few ingredient changes. Whole Foods Market sells their salmon burgers in the fresh seafood section of their stores. They sell several different flavors such as lemon thyme, bacon chile, teriyaki, and my favorite spinach feta. 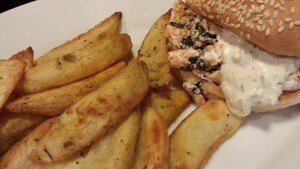 My version of spinach feta salmon burgers contains just a bit of Old Bay seasoning which is a pretty prevalent seafood spice in the Delaware-Maryland-Virginia area where I live. I’m not sure what other ingredients that they use in their spinach feta salmon burgers. Here’s what I came up with instead: Just mix together some diced fresh salmon, feta cheese crumbles, minced sweet onion, chopped fresh spinach leaves, breadcrumbs, salt, and Old Bay seasoning. Form the mixture into burgers and chill for a short period so the burgers will stay together in the pan. Saute the salmon burgers in oil until golden brown on each side. And serve. It’s pretty simple! 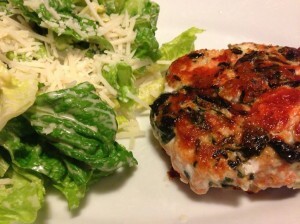 Offer these salmon burgers with a slice of tomato, shredded Romaine lettuce, and some garlic aioli. 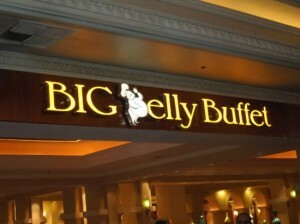 You may prefer my tartar sauce, a mustard mayo, or even a slice of cheese. They taste great plain, too! 1. Lightly combine all ingredients except the oil in a non-metallic bowl. 2. 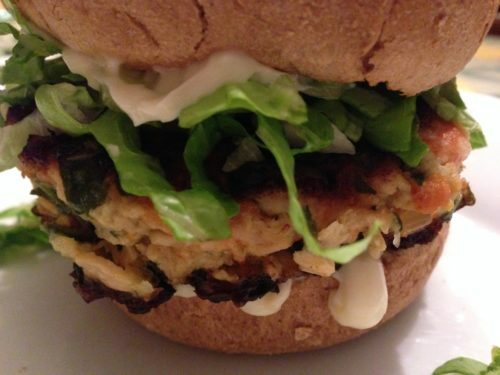 Carefully form salmon mixture into four burgers. 3. Chill burgers for about 2 hours, covered, in refrigerator. This step will help keep the salmon burgers from falling apart when cooking. 4. Heat a non-stick pan over medium heat. 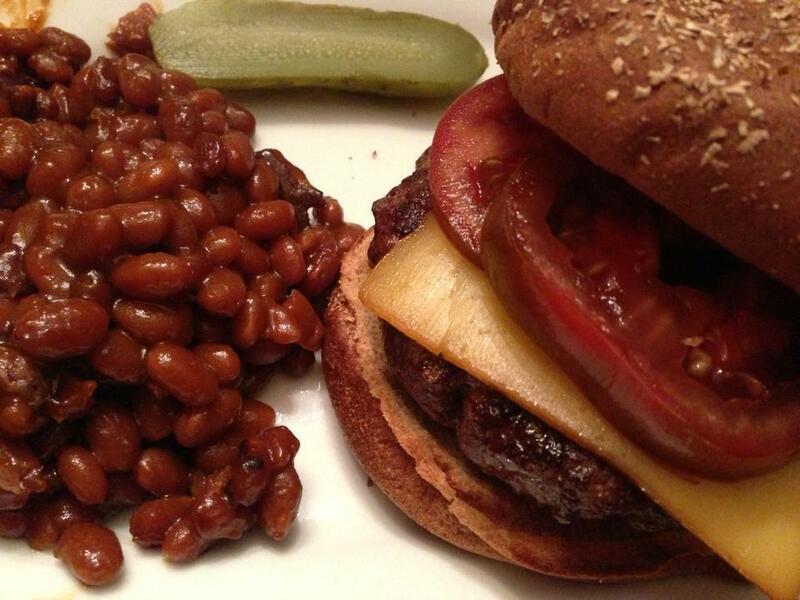 Add the coconut or canola oil and saute the burgers until light brown, about 3 – 5 minutes on each side. 5. Remove the cooked salmon burgers from the pan, and place on toasted buns. 6. Serve with garlic aioli or tartar sauce! Serves 4. Offer with sweet potato or regular potato fries, onion rings, or bun-less with a side salad. Variations: You can use other fresh salmon if you can’t find sockeye salmon. Add a tablespoon of crispy crumbled bacon or chopped smoked salmon to the salmon mixture for a smokier flavor. Coat the salmon burgers in panko breadcrumbs for a crispier version. Or serve with a side salad.